The Two Door Tall Buffet has two doors and a raised foot. Behind the doors are three shelves, the shelves are fully adjustable. The buffet cabinet face has fluted moldings on each side. The doors have a raised mitered molding and flat panel insets. 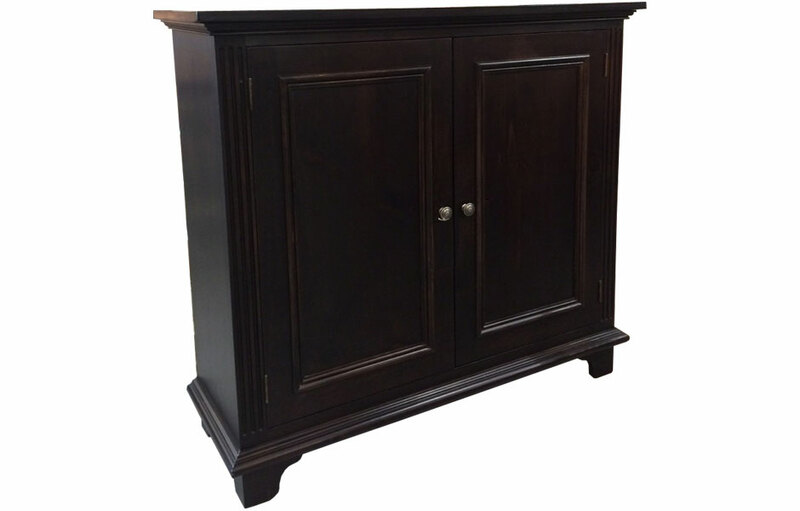 The tall, narrow Lorraine 2-Door Buffet is a stylish sideboard for a small dining room, foyer, or bedroom. 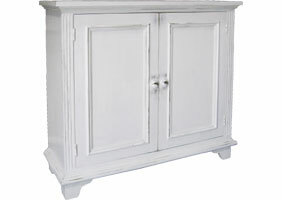 The understated Provincial styling, and small size makes it an ideal cabinet for myriad of uses. At 44" high and 17" deep, the buffet is the right height and depth to use in a entrance foyer with a mirror above it. 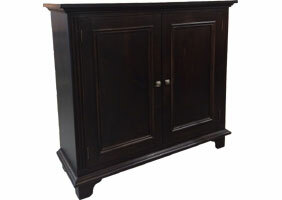 The 4ft width makes an ideal dining buffet for small, narrow dining room or kitchen nook. The two door design is delicately balanced with fluted side moldings and square bun feet giving the piece French gravitas. Inside the 4ft wide cabinet are three fully-adjustable shelves to store everything from; table linens, serveware, dishes, books, to toys. The doors have a raised mitered molding and flat panel insets. 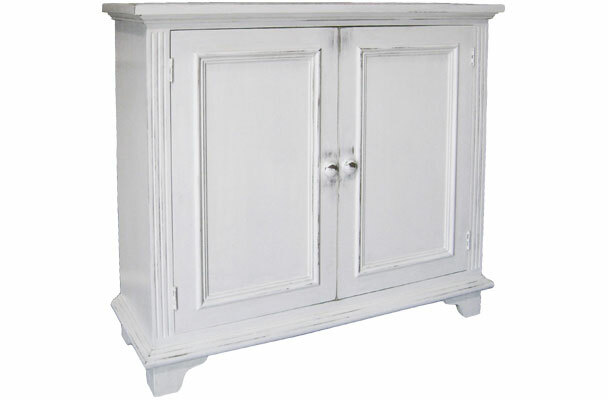 The sideboard has wooden knobs completing the European styling. 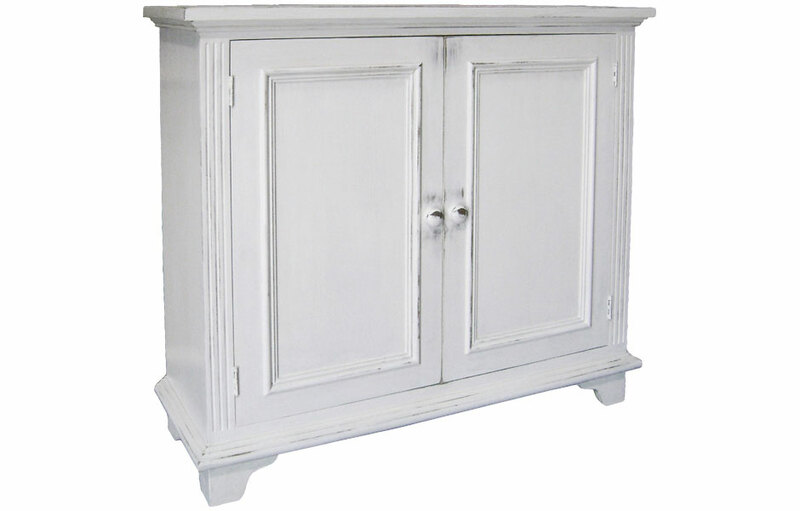 The understated Provincial styling makes it an ideal buffet for many uses. It's elegant bathroom storage for towels and bath products, and perfect low closed storage in a nursery for children's clothing and toys. The two-door design with adjustable height shelving lets you be creative. The small sideboard can be painted in a classic two-tone finish with a stained interior and top, with painted exterior, or all-over one color finish. The top is water-sealed for daily-use, and food and drink service. The Lorraine 2 Door Buffet complements French Country, English Cottage, Farmhouse, Rustic, Transitional and Traditional style decors. Two Door Tall Buffet with Sturbridge paint. Two Door Tall Buffet with Espresso stain.